Read that again. 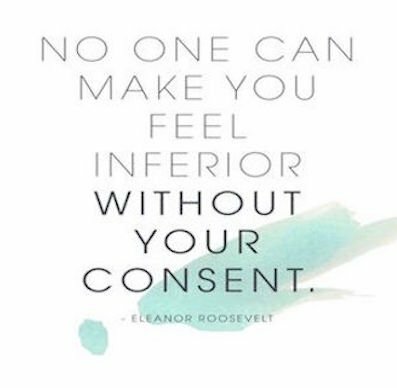 “No one can make you feel inferior without your consent.” I love this idea bc it so beautifully highlights the power we have when others judge us, criticize us, or make us feel less than we deserve. The thing is- people will be people. We cannot change or control what others will say or do. Whether they make fun or are your greatest cheerleader, the only thing we have control over is how we react to them. And the meaning we make of their words. For example, maybe someone doubts your ability to be successful- if you smile, thank them for their input, and walk away their insult gets forgotten about. But if you give them permission, if you allow your own self-critic to fed off the comments and feel inferior as a result it gives power to their message. We live in a world full of messages and we make meaning of them all the time, most of which come without thinking. We are constantly making meaning of the world around us. “It’s attractive to be skinny.” “We have to be smart and go to an Ivy League school.” “It’s impressive to make a lot of money.” And when we listen to these messages over time, they become our truth. Don’t let others make you feel inferior. Play big, not small. Know your worth. Remind yourself if you forget, but whatever you do, do not let others define you.